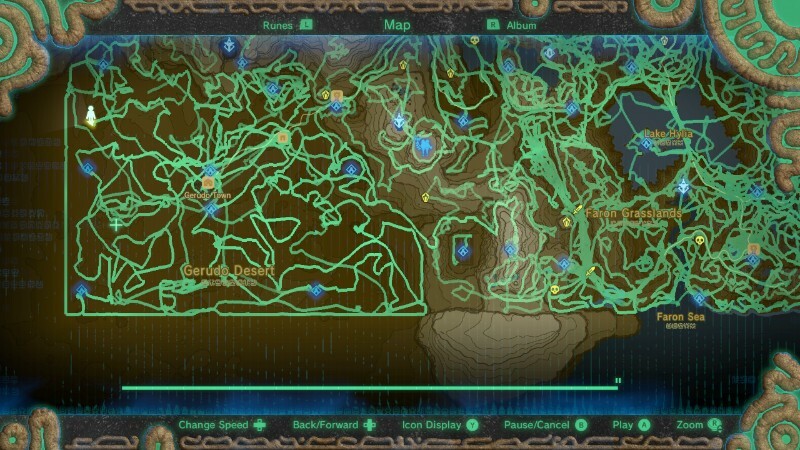 Despite this feature making it look like a three year old drew all over your Sheikah Slate map, the Hero’s Path Mode in Breath of the Wild is actually pretty useful. Letting you backtrack and retrace your steps to any location you’ve been to before does come in handy. And as it turns out, this mode was originally used to help test the game. Slate: Now this game, as we’ve discussed, has many, many new systems. It’s a very big, expansive world. And then when you bring in all the different play mechanics, I imagine this must have been a very challenging game to test and balance throughout development. I wonder how you went about that. Fujibayashi: From the beginning, we knew that this was going to be a big-scale project. So, we thought about adjustments from the very beginning. So, what we did was we would have all the players’ data from their PC collected into one and have it analyzed. Once we collected that data it would just display on one screen. And I think I mentioned this before somewhere, but we had three hundred people playtest the game. And that information, with their name, how many hearts they had, or how many times they died, would be shown on this screen. Speaking about this broadly, we would also be able to look at where these players went. So initially, you would see a cluster of a lot of people at the Great Plateau, but then they would disperse. And then we could take a look at where they die, or we would also see some people just taking a completely different route than we expected, but it made the process very easy because we were able to see where players went in just one screen. Aonuma: And interestingly, the Hero’s Path, that function that was released in the DLC, that’s actually something that was initially a development tool for us to be able to track a player’s progress, see what happened to them, where they went, and what they did. That we ended up changing into a fun feature for players and releasing in the first DLC. What do you think of this folks? How often have you used the Hero’s Path Mode? Let us know in the comments below!